The lighting phase of the interior design process is more than simply choosing the right fixtures. It’s an intricate undertaking that requires juggling and balancing several design elements to get it just right. Lighting fixtures, color palettes, natural light provided by windows and sky lights, and even the finishes throughout the space all have to work together to create the perfect combination of task and ambiance lighting. When lit right, spaces not only look fantastic but feel fantastic, too. For this sleek city condo, I took advantage of natural light by opting for sheer window treatments and a soft neutral palette that I then anchored with a few dark accents. Lighting in the bedroom can be tricky as clients are often particular about lighting as it relates to their sleep schedules. Since this city condo has space limitations, I knew that I had to keep it airy and light. White bedding helps to amplify natural light while the area rug and window treatments provide the perfect amount of color. To achieve a truly luxurious spa-like master bath, I used a combination of fixtures and a strategic window treatment to achieve a therapeutic-like ambiance. A ceiling dome fixture and track lighting supply the task lighting in this elegant urban kitchen while cabinet lighting and warm marble lower lighting to make the space inviting. My design team and I achieved the layers of lighting in this sophisticated dining room using a stunning modern chandelier and contemporary lamps. Display lights illuminating pieces of art add the finishing touch. This was one of my favorite spaces to really play with light. For this exquisite art deco foyer, my design team and I created a true masterpiece by harmonizing lighting effects with carefully selected finishes and artistic touches. Here at Paula Berg Design Associates, my team and I are passionate about approaching every design with attention to detail in order to achieve luxurious interiors with high style, luxury, and comfort. 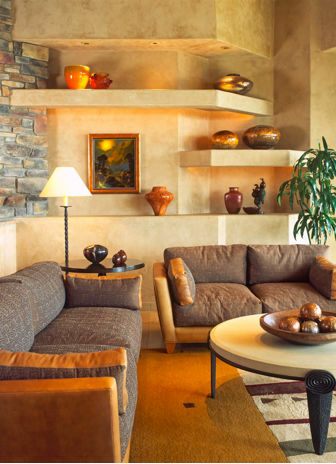 Contact us today to learn more about our interior design services in Park City and Scottsdale. One of my favorite parts about creating custom home designs is personalizing living spaces to reflect my clients’ lifestyle, passions and hobbies. Whether I’m working with a fine art collector to design a chic Honolulu high-rise condo or an avid hunter and outdoorsman to design a beautiful backwoods mountain home, there is always a way to gracefully incorporate personality. For this home design project, I had a custom media center designed to hold my client’s collection of sculptures. The custom art cases are even complete with display lights. As Vicente Wolf says, when it comes to incorporating art, “Good lighting is crucial. Another custom media center I had designed for a home design project created the perfect platform to display my client’s colorful glass art collection. I love the energetic color accents it adds to the space. For this client, I was challenged to come up with a design that incorporates a multitude of fine art from glass sculptures to large-scale paintings. The key was to create a design that focused on textures while a serene, neutral palette allowed the colors of the artwork to really shine. Who ever thought a canoe could look so good? This decoration was no easy feat to install, but it was definitely worth the final results. The client loved the rugged touch it added to their rustic mountain home. In another mountain home design, I enlisted the help of a lighting fixture artisan to craft these snowshoe sconces. They were the perfect touch to this rustic powder room with natural stone and wood vanity. No matter what your design aesthetic, lifestyle and passions, my award-winning design team can help you to achieve a home custom designed to reflect what you love most. Contact Paula Berg Design Associates to schedule your design consultation today. Too many walls are underestimated for the potential impact they can have in a space. I love empowering walls with wall coverings, tiles or artwork that can enhance the look and feel of interiors. When designed right, these decorative walls can provide phenomenal beauty and interest without taking up precious space and without running the risk of clashing or competing with other design elements. Here are a few examples of how I like to help walls talk. 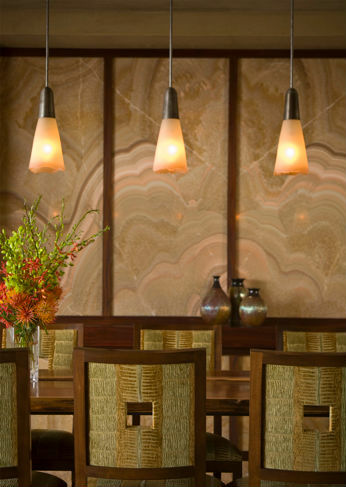 For this luxury home inspired by nature, I incorporated an onyx accent wall in the dining area to serve as a stunning backdrop. As you can see, the natural patterns and variations in color create beautiful movement that makes this wall more like a work of art while still maintaining an air of understated elegance. Backsplashes are always a popular way to infuse kitchen walls with more interest while serving their utilitarian purpose. 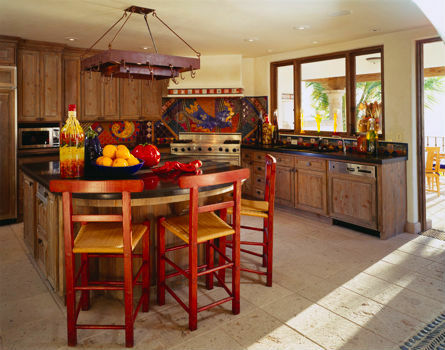 Here, I used a bold and eclectic tile backsplash to infuse this space with energy and artfulness. I love the results! Thoughtful and engaging architecture can also help to empower walls with eye-catching interest. For this space, I designed a wall with built-in shelving to hold a collection of artful vases. I also took it as an opportunity to play with depth and direct where the eye goes next. A combination of materials can be selected to give walls more of a role in the overall design. 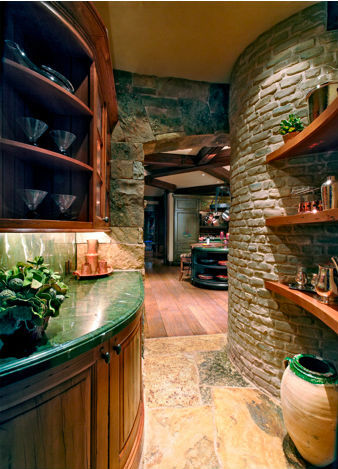 Here, I used two types of stone side-by-side to bring rich texture and intriguing shapes and lines to a sophisticated rustic-style kitchen. Simply adding the right piece of art to the right wall can create a focal point that helps to tie different design elements together while introducing new lines, forms and colors into the space. I love this large-scale abstract piece of modern art and how it tactfully brings out tones in the wood ceiling and stonework. 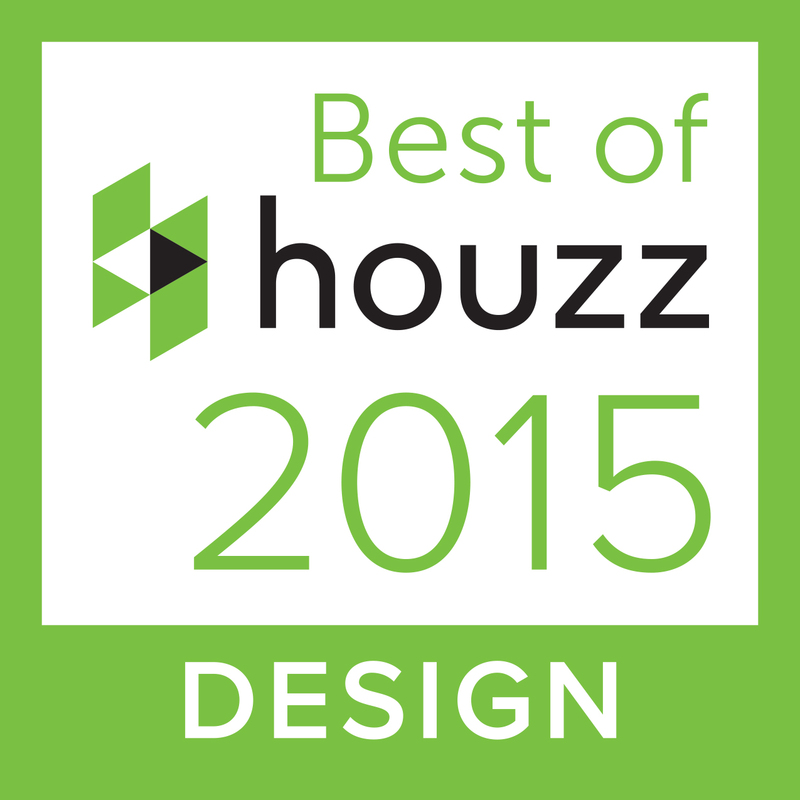 Let me and my award-winning team help you achieve a home that is full of inspiration and interest. 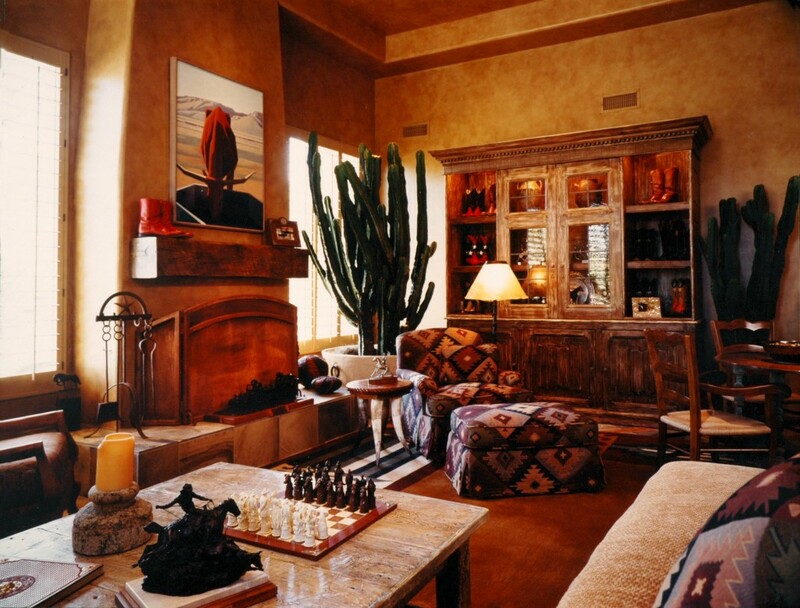 Contact Paula Berg Design Associates to schedule a design consultation. Whether it’s majestic mountain views, sparkling shorelines or serene desert scenes, you can’t go long without being reminded of the phenomenal beauty and wonder of nature here in the Western half of the United States. Mother Nature inherently becomes the ultimate source of inspiration when it comes to design. And what better way to complement interiors with organic forms, materials and colors inspired by nature than with Mother Nature herself? Whether with a single potted plant or a mosaic of foliage, I love adding life to interiors by incorporating plants into décor. In this dining room, a modest-sized yet still distinct cactus on the sideboard table adds a welcomed pop of color. It also adds sculptural interest that bodes well amidst the other works of art. An eye-catching cactus became the architectural centerpiece and focal point of this desert-inspired home my team and I custom designed for a client. I just love the dramatic scale and shape it adds to the space. For this gorgeous great room, I strategically chose plants to incorporate throughout the entire space. The energetic bursts of green add vibrant life while breaking up and enlivening the rich colors and textures. Now this flashy master bedroom design may not be for everyone, but I love how my design team and I enlisted the help of a stunning large-scale fern to add contrasting colors and lines not only with the plant itself but with the shadows it casts on the walls. Once again, a combination of plants became the best way to create harmony in this space. The greenery adds contrast and interest while also beautifully balancing the visual weight of elaborate textures and elegant furnishings. Plants make for the perfect finishing touch in many spaces, but you first have to start with a fabulous design. Whether you are looking to design a new home or remodel an existing home, let me and my award-winning team help you design custom living spaces that will comfort and inspire. 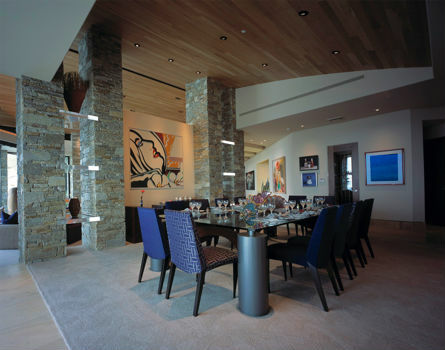 Contact Paul Berg Design Associates in Park City or Scottsdale to schedule a design consultation. A designer is only as good as his or her vendors, as I see it, because beautiful, high quality designs require beautiful, high quality products and furnishings. Today, I want to shine the spotlight on Hokanson, a business that has been leading the custom rug industry for over 25 years, and which I have turned to for multiple projects. 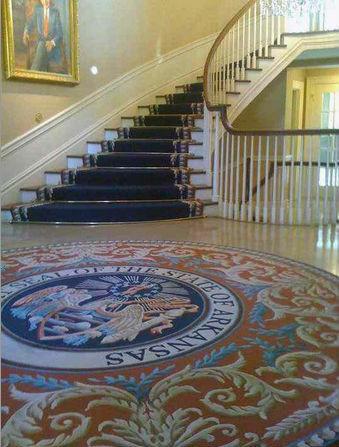 Palaces to even our own White House Oval Office. Hokanson’s reputation has been built on its ability to create anything from exotic and ornate traditional patterns to ultra-chic contemporary designs. They are also known for their keen ability to work with exotic yarns and other unconventional textures and fibers. 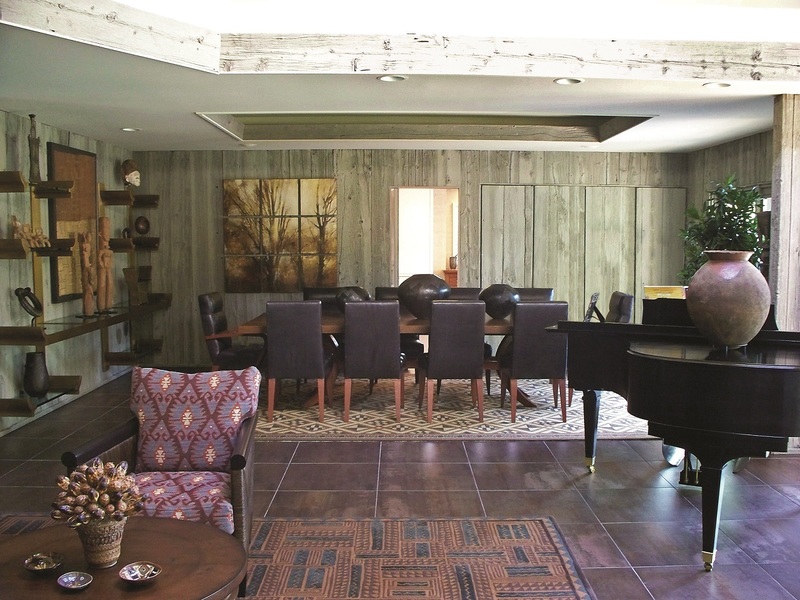 Here’s one of my own interior designs featuring custom rugs by Hokanson. They added just the color and pattern I needed to complete this sophisticated, rustic modern look. Have you worked with Hokanson before? What was your experience like and how do you like your custom rug or carpet?